Despite the challenging weather conditions, forty-four runners entered the fell race. The last time this course was run was about 15 years ago. However, after being resurrected, the course did not disappoint! One runner commented the route was ‘brutal’! I take that as a compliment! The field quickly spread out as a short section of road led up a steep switchback exiting Slaidburn. As the runners entered the lower meadows, members of the newly formed Ribble Valley Harriers Club quickly dominated the front of the pack. Chris Holdsworth had a clear lead at the fell gate, which grew even further on the way to the turning point on the summit of Easington Fell. Chris further extended his lead on the descent, to finish over four minutes ahead of his nearest rival. His club mate, Katie Walshaw, had a large lead against the other female racers at the summit and easily maintained this to be the first female back to the show field. Nickey Russell seemed to excel on the rough ground and took 10 places once unleashed onto the fell proper. Bowland’s own Phil Martin, did a splendid job as "Lantern Rouge" whilst tackling the terrain at 75+ years of age. At the other end of the spectrum, Will Barlow was the only junior brave enough to enter the junior race and was rewarded with first place with a fast-paced time of 12:34. As is now tradition all finishers received a bottle of Bowland Brewery Beer for their efforts. We owe a huge gratitude to all the marshals and Bowland Mountain Rescue Team who assisted with the race in very wet conditions. The Hodder Valley Show has a long history of working successfully with the Bowland Fell Runners Club. Bowland Fell Runners are a dedicated fell running club with about 100 members formed initially to promote fell running in the Forest of Bowland, for those who have an affinity with the area. Most live south, west or north of the Forest of Bowland and with weekly training activities in and around the fells near Chipping, Lancaster and further afield. Each year our race is well received by the all the runners, who enjoy the new routes as well as the tried and tested routes. Bowland Fell Runners Club thank all seniors and juniors for competing and turning the fixture into two good races, to the land owners and tenant farmers for allowing us to cross their land, to the members of Bowland Fell Runners, their friends and families who turned out to assist with the organisation and marshalling of what is a “marshal intensive” course and also to members of the Hodder Valley Show committee for hosting our race within their day’s intensive programme. The event is open to club members and non-club members. Entry Fee to show includes entry to fell race. Prizes for 1st: 2nd: 3rd & additional prizes according to entries. 1st Senior Veteran 50 years and over. 1st Lady Runner: Prize for 1st Local Non Club Runner. 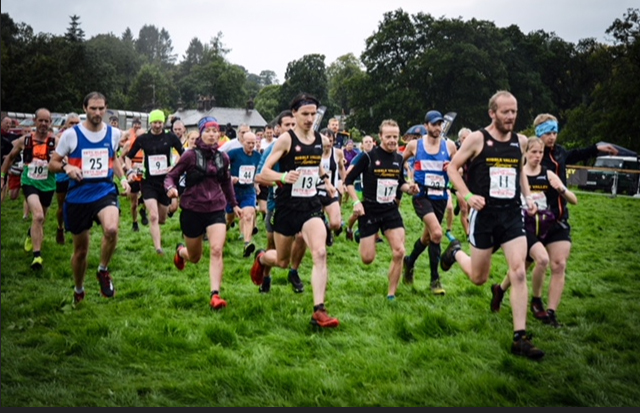 36 runners braved extreme mud and heavy showers to run the Hodder Valley Show race, this year held at Dunsop Bridge. Last year’s winner, Phil Marsden (Horwich) and Carl Bell (Keswick) reached the turn-around trig point on Totridge Fell, with its memorial plague to fell running legend Bill Smith, together, but Carl showed his downhill strength to win by over a minute. Jenn Mattison (Keswick) comfortably won the women’s race. Local lad Sean Grover of Newton-in-Bowland showed special grit to run as an U19. Clayton were the winning women’s team and Bowland won the men’s team prize. All finishers received a bottle of Bowland Beer which appeared to be well received. Many favourable comments were received about the course, last run as an English championship race three years ago. My thanks go to all the marshals from Bowland Fell Runners, to Bowland Mountain Rescue team, to Clayton-le-Moors Harriers who made the race a counter in their 2017 club championship, and to the usual Race Organiser, Steve Cox, who did all the preparatory work. A strong field of 87 senior runners set off from a sunny show field in Newton-in-Bowland. As stalwarts of the race will be aware, the race route alternates as the Hodder Valley Show moves between the villages of Dunsop Bridge, Newton and Slaidburn. Furthermore, local shoots have also forced different courses to be run on some years! 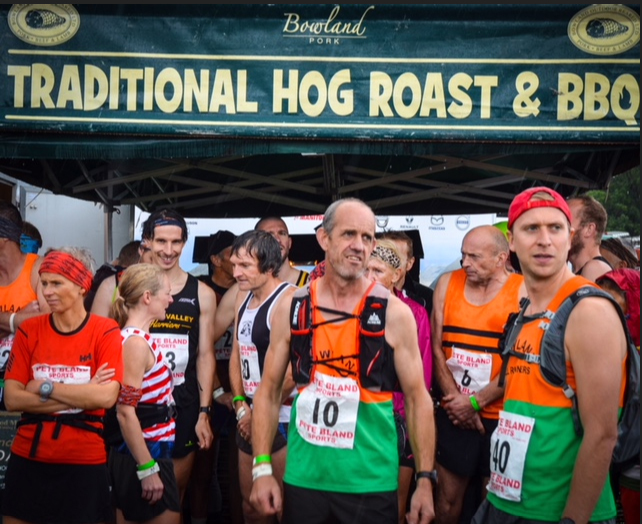 This year saw the return to a fantastic route which was last run 6 years ago and saw runners ascending steep farmland with fast running over hill and dale to reach the fell. By the fell gate onto Beatrix Fell, Philip Marsden form Bolton Harriers had a modest lead. On the climb and return to the show field this was stretched to almost a 4 minutes lead over Matthew Cordus, with Philip winning in an impressive 51:31 minutes. The first female was Helen Buchan from Calderdale Valley who had a comfortable lead over Amie McAvoy. All finishers received a bottle of Bowland Beer or some Mrs Kirkham’s Farmhouse Cheese….guess which was more popular! "Checking the Fell race route. We hope visibility is better on the day!"